Expectations of Motherhood: I can’t think what my expectations of motherhood were. I was very clear I wanted children, but I’m not sure I’d properly thought about the whole thing of bringing up a baby. I knew it would be hard but I think during pregnancy I was very focused on being pregnant and the birth and had maybe forgotten to think about the baby bit! In some ways this was really naïve, but then at the same time I’m glad I didn’t spend loads of time looking at books and building up an unrealistic sense of what motherhood and my child was going to be like. It meant that I hadn’t set myself really high expectations (first time round). 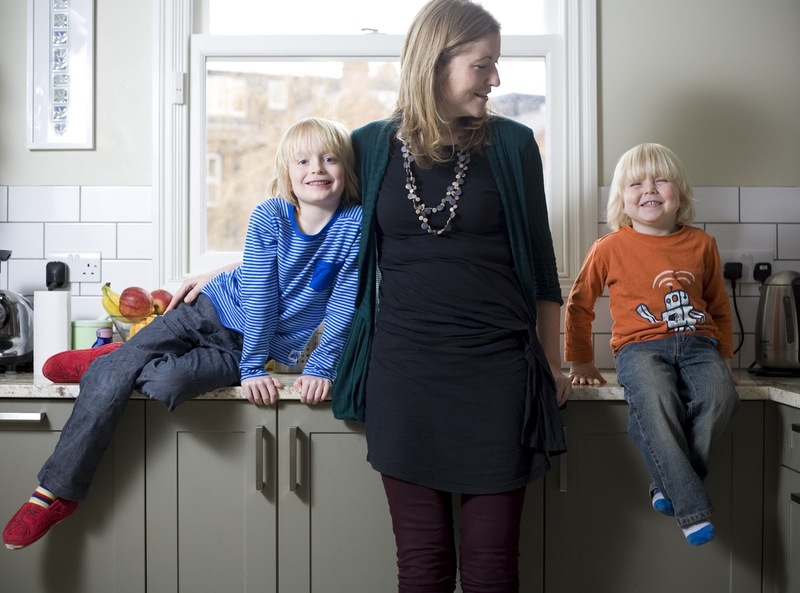 I hadn’t spent loads of time thinking about how I was going to ‘do’ motherhood, I rather muddled along, which has worked pretty well for me. I guess there are things that I’ve found myself feeling quite strongly about, but they’ve not been things I’ve thought about loads in advance, more stuff that I’ve come up against and found myself having quite clear ideas about what is the right thing to do for my family and me. Reality of Motherhood: I look back at myself when Jake was a baby and I think I had some crazy times. Jake was the kind of baby (or I was the kind of mother) that wanted to be permanently attached to me, feeding, carried whatever and lots of crying (can I just balance this with saying he was also the sweetest loveliest little thing, but he certainly wasn’t an ‘easy’ baby, if there is such a thing). And I totally went along with his every whim. Some of the time this was OK, but I remember once being on the phone to my friend and crying saying I haven’t even been able to have any lunch (bless her I’ll never forget this, she then got a box of groceries/goodies sent round to me that afternoon, so sweet and she must have thought I was losing it!). I have to remember those times when I see first time mothers seemingly fussing. It’s such a life-changing experience and you kind of exist in a bubble for those first few months. Second time round with Ted, I was properly prepared. I knew (or thought I knew) how difficult it was going to be. And then Ted was the happiest, easiest baby.. apart from reflux and the sleep thing, which took over 2 years to work out! But whether it was me being less highly strung, or what it was, he seemed pretty contented from day one and I found motherhood so much easier second time round. Taking your children home for the first time: When we brought Jake home it was so exciting, my mum and dad had driven up from London and I just couldn’t wait for them to meet him, it felt really special. With Ted it was all about Jake. Ted’s birth was really quick and I had him in the night so basically we went into hospital at midnight and were back around 6ish, so before Jake was out of bed. I remember it so well, saying “Jake there’s someone we want you to meet” and him coming downstairs and sitting on the sofa next to Ted asleep in his car seat, with Jake grinning from ear to ear. I have a photo and it’s one of my favourite ever pictures, Jake just looks so happy, so excited. I just remember how huge and grown up Jake suddenly seemed, 3 years old but suddenly a proper little man. And then, calling my mum up from the spare room in the cellar. She thought I’d just gone in for a check-up and had no idea that there would be a new grandson waiting to meet her. The best/worst advice: I don’t know that I sought much advice as such, apart from specifics like to do with breastfeeding and sleep when I needed them, but I can’t think of any lifesaving advice that has helped me, in particular. However I have been very lucky that I’ve got lots of friends and people around me who don’t push advice on me but are there for me if/when I need them. I am also lucky that my mum isn’t one of those ‘I know best types’ and I think maybe I took my cue from her in terms of just going with the flow working out what worked what didn’t etc. Maybe the best bit of advice I heard after Jake was a bit older and some friends and I were reflecting on early motherhood was that “nobody ever tells you that babies won’t die from crying” – meaning you can put them down for a few seconds, rather than in the sense of leaving them to cry all day. Which actually I wish someone had said to me when Jake was very small, as this probably would have made a huge difference, even though it is so obvious! The hardest parts of being a mother: When the children are ill. We’ve been lucky with both Jake and Ted, there are no significant long term health issues that we’ve become aware of. However Ted’s had a few scares along the way, some worries with his breathing when he was very small, a hernia op and most recently (just after these photos were taken) a meningitis scare. For a child under 3 he’s had too many nights in hospital and it’s been in part awful – watching your child go under general anaesthetic is not an experience I would want to repeat – but at the same time he’s amazed me by the way he’s coped with situations like this. When we were in recently for two nights, he was ace. Once he felt a little bit better (but we were still waiting for blood test results) he saw it as an adventure, which made it easier for me to cope with the situation too. It’s only when I stop to think, I get scared about what might have been and also think about all the children and families whose hospital visits aren’t quite so fleeting and realise how lucky we are. I think the hardest thing is this overwhelming responsibility you feel, when you don’t always feel like a responsible adult yourself. I should also say the challenges of combining a career with motherhood. For me this necessitates working most nights and constantly juggling my part time job with school pickups etc, but then I’m also so pleased I’ve been able to do this, and happy to accept the challenges this involves. The best parts of being a mother: It’s so difficult to separate out the best parts. I love being a mum, I love the strength of the bond I have with my two boys, I love seeing them grow up, learning new things. I love the way they are with each other. I love seeing them laugh and grow into individual personalities. I love watching my children when they are unaware of my presence and just getting on with their lives, talking and playing with friends. It feels like such a privilege to be part of something so exciting. Hopes for your family: It’s quite simple; my hopes for Jake and Ted are that they will be happy. For me I think confidence is a really important aspect of being happy, and I hope that’s something I can help instill by being supportive and encouraging. I also think it is my job to help them to learn to be caring citizens which involves lots of things including being tolerant of many different kinds of people from different backgrounds and basically thinking about others rather than just themselves. Of course as young children they are currently fairly self-centred but I hope they will develop into sensitive, but also hopefully hilariously funny, adults. And I hope that we manage to retain a close relationship and friendship in their adult years. What advice would you offer to new and expectant mums: I think it has to be to go with the flow. I don’t think you can ever fully prepare yourself by reading and listening to people, as so much depends on what works for you and you baby/family and how you are feeling at the time. I’d say don’t set the bar too high in early motherhood. So what if you are still in your pyjamas at midday? What does it matter if the housework isn’t done? Enjoy your time with your baby and try not to put yourself under too much pressure, do what works for you and your child. It sounds clichéd but you will never get that time back and I think it’s important to find your own way that works best for you.